For many well-seasoned travelers, packing a suitcase for a trip comes second nature, thanks to lots of practice and trial and error. For others, packing is just one more stressor in addition to the airport’s less than soothing ambiance. Whichever category you may fall into, these Packing Cubes by AmazonBasics will be a total game changer next time you need to pack your bags. The expandable cubes will also help streamline your packing routine, keeping your belongings neatly stored and conveniently organized. The set comes complete with four zippered cubes varying in size, that will nicely accommodate smaller items and accessories such as socks, undergarments, tank tops, belts, infant necessities and more. The pouches also allow for grouping items in a variety of ways. Use the pouches to pack pre-planned outfits for each day of your trip into separate cubes, or keep similar items together (like jeans) in one cube and dress shirts for business meetings in another. Travelling with the whole family? Another option is to designate one pouch for each family member. In addition to their expansive range of uses, these packing cubes are also machine washable and lightweight, adding to their convenience factor even more. Made of a 100% polyester-nylon, simply zip the packing cubes closed and machine wash on gentle cycle in-between uses. The nylon fabric is durable yet lightweight and offers loads of organized storage ideas without adding significant weight to your bag. The bags come with a webbing handle for easy grabbing, carrying separately or hanging. Another bonus is that the packing cubes offer mesh tops for maximum breathability and visibility. The mesh-top panels offer ventilation to keep your packed items fresh but provide at-a-glance viewing for easily identifying what’s inside. For those travelling with delicate items like lingerie or silk blouses, rest assured that the cube’s soft mesh composition will not damage delicate fabrics but will actually help protect them from damage. 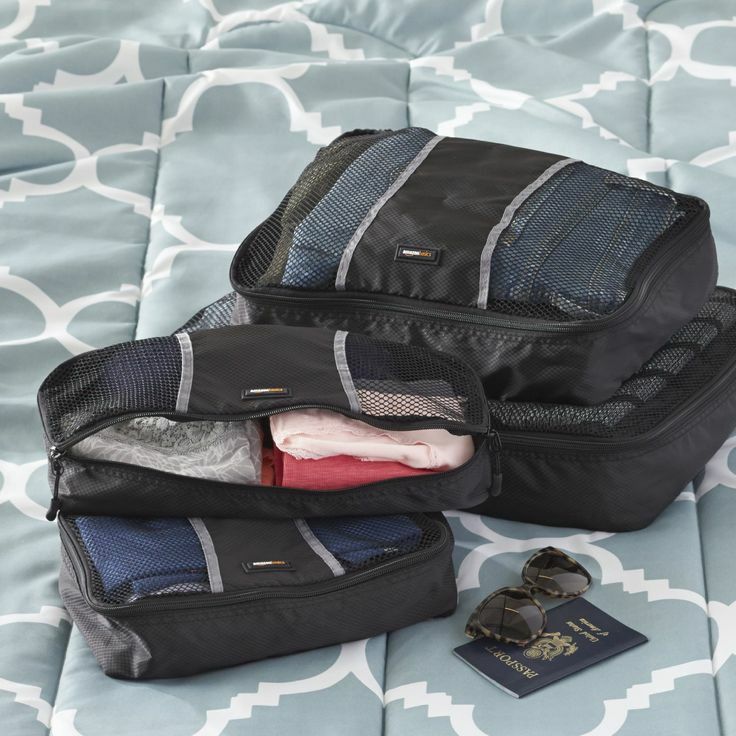 Whether you travel on a weekly basis or once a year for vacation, these packing cubes are a must. Offering exceptional versatility and time-saving convenience when it comes to packing and unpacking your suitcase, this packing cube set will change the way you travel.